It's been several years and this topic is being ignored, why the master pass is a frustration rather than a secure and simple way of storing passwords. Why it is so hard to make a button to type it whenever we need it or not, or at least add options to it: (Like - NEVER PROMPT, use sync without need to enter master pass ). Why whenever i start firefox i have to close multiple prompts and it continues to spam and spam on every damn site. NO! i don't want to go in incognito and yes i do want to store entered passwords. DO WE ASK TOO MUCH? Before I could use MasterPassword+, this plugin did the job for you, now it is not compatible with new update, and going on older version of ff does not let me use sync. Add a simple button and let the people choose! Just so you're clear about things, we are not Mozilla. This forum is not run by or formally associated with Mozilla. We're an independent user-helping-user community. Install Keepass which is what I use. It's an independent open source password manager which includes a password generator and supports many plugins written by an enthusiastic community. To add username and password to a site, simply right click the entry you created and choose those options. 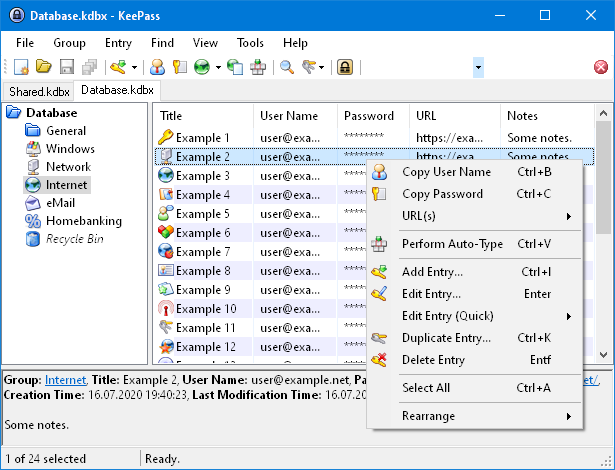 The data only remains on the Windows clipboard for 12 seconds or until you close Keepass making it a secure method of entering sensitive passwords on sites. Here's a screenshot of the context menu. You can consider to set the restore on demand prefs to true if you are reopening a lot of web pages with a login form automatically. You can also use a user.js file to disable the Password Manager and only enable the Password Manager if you need to login to a website. Note that you can use "Saved Logins" or "Show Passwords" to login to the software security device. Options -> Security: Logins:  "Remember logins for sites"
I think that Sync will still ask for MP on startup if you use this feature even with the Password Manager disabled, but that would only be one request.